Facebook makes a lot of changes and that can be really frustrating for marketers, especially those of us who do it all ourselves, right? Part of my job is to keep you up-to-date on changes and tactics that will help you successfully navigate your social media marketing. Remember, more time is spent on Facebook than on any other platform on the web (besides Google). This means that it's getting easier and easier to market there, because Facebook really does care about making it an effective tool to help you attract your ideal clients. Here's a list of Facebook marketing tactics that you can use right now. 1. 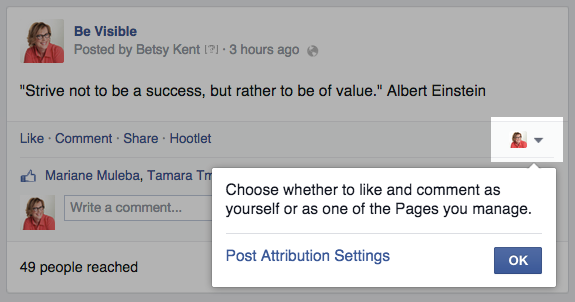 Post as yourself or as your page with this nifty new tool. At the top right of your status update window you will now see this little drop-down menu that enables you to post as yourself or as your Page (or any Page you manage). 2. Copy and paste a post to use elsewhere by clicking on the time stamp and getting the URL. Now you can repost on other Social Media sites (such as LinkedIn) or shorten the URL and use it on Twitter (love this idea - thank you to Mari Smith, Facebook marketer extraordinaire). 3. Schedule your posts 10 minutes into the future to avoid typos. It's awful to post an update and not notice a typo until after your community has noticed it...very embarrassing! So schedule your post for 10 minutes into the future and proofread it in the activity log. You'll be amazed at the typos you'll avoid! 4. Use images that follow the guidelines. Facebook is a great place to post big impactful photos and images. The ideal size for an update is 1200×628 pixels, but according to Jon Loomer, my go-to-guy for Facebook nitty-gritty, 484×252 also works well. Keep this in mind when you use photos in your blog because Facebook will pull your featured image into the preview box. Which would you rather see? 5. 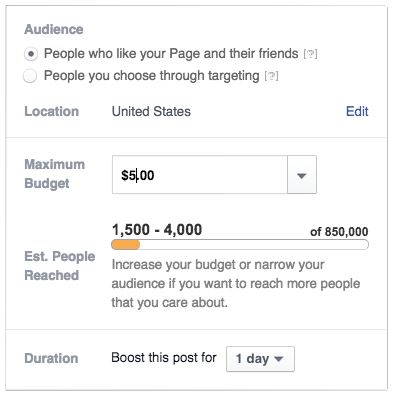 Don't be afraid to spend a little bit of money on your post reach. You my have noticed how few fans your posts are delivered to: only about 6%. All your hard-won fans really do want to see your stuff (or they wouldn't have Liked your page). Boost your important posts for just a few bucks...it's worth it. 6. Look at your Facebook Insights to see what time of day you should post. It's a great tool but many of us never look at it in depth. If you don't have time to dig through Insights, this is the one metric (which one? this is confusing) you should pay attention to. To get there, click Insights then Posts. 7. Find out what other pages your fans Like with this nifty trick. So, there's the latest Facebook marketing tactics to improve your reach and engagement. Did I miss anything? Let me know. Thanks to fellow marketers Mari Smith and Jon Loomer.